The festival of Holi nears, and sweet shops across the nation are resplendent with rows of colorful barfis, gujiyas and other yummy delights. You can't avoid noticing how many of these sweets are covered with a thin foil of silver. 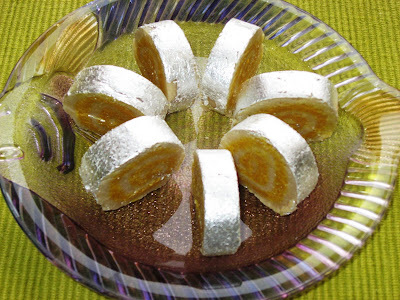 For centuries these edible, gossamer-thin sheets of pure silver (or even gold during our princely past) have been popular decorations for special-occasion desserts, confections, even nuts and pulao. Warq or varak, can be easily found in Indian markets. These gold- and silver-leaf sheets usually come in packs of twenty-four, with each delicate foil sandwiched between two sheets of paper. Warq sheets are so fragile they dissolve easily with human touch and can be torn by the barest breath of air. It is best to remove the top piece of paper from a sheet of wark, invert the warq on top of the food to be decorated. The warq will stick to the food, and the paper can be peeled off. Warq will keep indefinitely if stored in an airtight container (to prevent tarnishing) in a cool, dry place. Warq is about a millionth of a millimetre thick and is used sparingly, though thoughtfully, in North Indian cuisine and some alternative medicines in India. What most people are unlikely to know is that this decoration on the pure vegetarian sweet is made by pounding silver or gold pellets between two sheets of leather. Animal hide! For some reason, all warq produced in India is still made the traditional way manually. "It is an aphrodisiac," gushes Imtiaz Qureshi, grand master chef at ITC Grand Maratha in an interview with Times of India. "Nawabs and their courtesans alike were served warq in generous mounds." In the courts of the Nawabs of Awadh, warq was used to bedeck elaborate dishes combined with saffron, pista and almonds, says Qureshi. He makes special mention of the Kundan Qualiyan, the famed royal Awadhi dish that today’s non-royalty can try, albeit in a five-star hotel. Kundan Qualiyan is made with tender morsels of lamb cooked in a saffron tinged thick gravy and served topped with a partially cooked egg yolk which when broken into the gravy adds to its golden hues. Further topped with gold leaf and saffron dyed almond slivers, this dish is as royal as they come. Gold warq is pure 24 carat. If other lower metals were added, the warq would break. In the USA, in your nearest gourmet supply store, you can probably find, boxes of gold leaf (sheets, flakes, or sprinkles) to you to impress your friends at your next dinner party. These thin pieces of gold add an impressive touch to chocolates, sushi, and just about anything else you can think of. Because the quantity of gold is so small, the price is not unreasonable; yet these gold highlights make a meal appear to be extravagant and give restaurants excuse to charge exorbitant prices. And yes: it’s safe to eat; metallic gold is biologically inert, which is why dentists use it for fillings, caps, and crowns. "It is a tonic," insists Jiggs Kalra, veteran food expert in the TOI article. He talks about the tale of Shah Jahaan who was jailed by son Aurangzeb and allowed only one meal a day. "His doctor created a dish, Shahjahaani Korma, which kept him going and also alleviated his health problems." Apparently, the dish contained gold. Few Lucknowi kitchens make Shahjahaani Korma today. However, gourmet chefs in India still conjure up Sone Chandi Ke Moong, Kofti Pulao with khoya slabs and lamb, and chicken biryani - all topped with warq. The top-end paanwala will sell you gulkand paan laced with gold. However, the use of gold and silver in food was not restricted to India. These noble metals have been consumed for centuries by Native Americans, some of whom believed that eating pure pulverized gold can allow humans to levitate. Silver has been used as a medicine and preservative by many cultures throughout history. The Greeks and others used silver vessels for water and other liquids to keep them fresh. Pioneers trekking across the wild west generations ago faced many hardships. Keeping safe drinking water was one of them. Bacteria, algae, etc. found a fertile breeding ground in the wooden water casks that were carried on the wagons. They placed silver and copper coins in the casks to retard the growth of these spoilage organisms. They also put silver dollars in their milk to keep it fresh. Settlers in the Australian outback still suspend silverware in their water tanks to retard spoilage. Silver water purification filters and tablets are manufactured in Switzerland and used by many nations and international airlines. Preventing growth of algae and bacteria in swimming pools is a similar problem that people face today. While anyone India can get some sweets with silver warq on them in the neighboorhood sweet shop, gold warq is mostly found in upscale, gourmet restaurants. 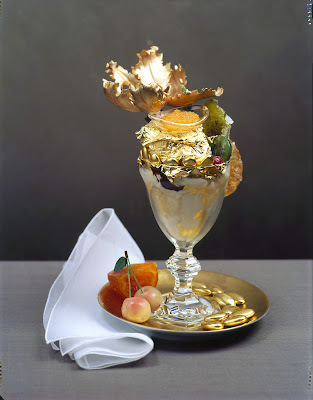 The world's most expensive dessert at the Serendipity restaurant in New York City is topped with gold leaf and costs $1000. 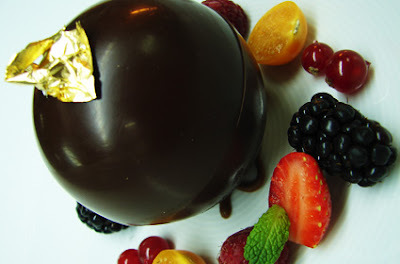 If you are in Dubai, try the Valrhona Chocolate Sphere ($75 each) at Al Mahara, Burj Al Arab. 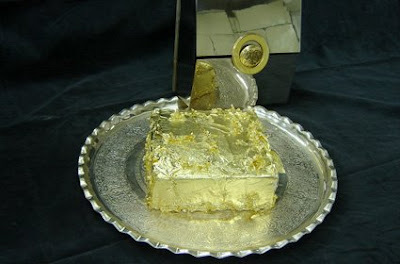 Another extravagent gold-topped treat is the $1000 Sultan's Golden Cake at the Ciragon Palace Kempinski in Istanbul. We prepare 'puranpoli' A sweet roti in Maharashtra on Holi..
Those are exquisite. I do wonder why the sheets are edible when they're in fact gold and silver? Aren't metals toxic? A very nice post again. There are a couple of Warq wallas near the old Tunde Miyan Kebab shop at Lucknow. The rhythmic sounds of pounding would always draw me to the place whenever I accompanied my dad to buy the kebabs. And the scene at the shop would always be the same; four men pounding away at the leather sheets with scarcely a break and amidst the persistent noise, a smiling bearded gentleman waiting to welcome the next customer. You brought back memories of Lucknow with this post Shantanu. Happy Holi ! @Ruminations: Oh yes, I know! We usually make Gujiyas during this time. @Lakshmi: Amazing and good for me! @Final Transit: Thanks! Hope you enjoy your Holi wherever you are now. millionth of a millimetre... wow! Yea, 'yummy delights' is the right words - my mouth is watering! You always present delicious food and a gorgeous way and this was the top of the cream! @RennyBA: Thank you! The top picture is from the Serendipity restaurant. We are regular exporters of indian curtains in silk, rayon and cotton. The same are made in plain dyed, shaded printing, design printing, Hand embroidered and machine embroidered with fringe and without fringe as appropriate.